Now Hiring 3 VISTAs to Start Service February 2019! AmeriCorps VISTA is a national service program that has been working to alleviate poverty in America since 1965. VISTA’s serve full-time for one year at nonprofit organizations or local government agencies to build the capacity of these organizations to carry out programs that fight poverty. 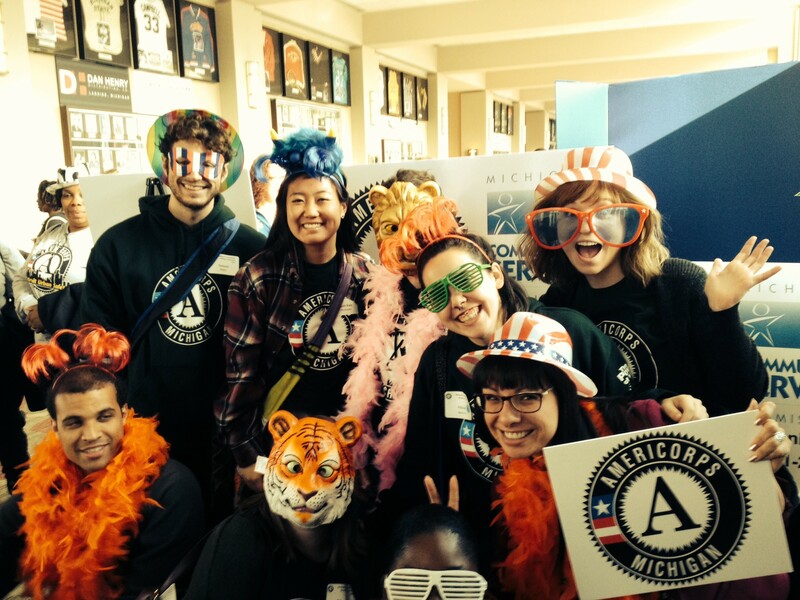 AmeriCorps VISTA members recruit and manage community volunteers, raise funds, and help manage projects. More specifically, the Power of We AmeriCorps VISTA Program focuses on building the capacity of organizations in the areas of Education, Economic Opportunity, and Healthy Futures. February 19, 2019 to February 18, 2020. The goal of the project will be to build resources to support neighborhood organizations and citizens in Lansing in designing, resourcing, and implementing projects that benefit the community. The AmeriCorps VISTA member will support neighborhoods and citizens in sourcing resources for projects of their design; cultivate partnerships among stakeholders, including community organizations, nonprofit organizations, and neighborhood organizations; assist with the Neighborhood Grants process; and, ensure sustainability of the program through volunteer engagement and the pursuit of additional funding opportunities. ​The goal of the project will be to assist neighborhood organizations and citizens in Lansing build the capacity of neighborhoods to organize and advocate for themselves. The AmeriCorps VISTA member will support the Mayor's Neighborhood Advisory Board; cultivate partnerships among stakeholders including community organizations, city agencies, and neighborhood associations; and support a communications strategy that reaches residents for marketing and outreach of projects. The VISTA Leader will support the Power of We AmeriCorps VISTA team through the year of service as they build capacity and sustainability at their service sites. The VISTA Leader will support the VISTA project and enhance its effectiveness, stability, and sustainability; assist in the development and coordination of trainings and service events for professional development; and, assist in the development of a recruitment plan and materials. In order to apply for this role, you must have already served at least one year in AmeriCorps VISTA, State or National, or NCC. Rose Henderson at rhenderson@ingham.org by​​ January 11, 2019 by 5pm. We're hiring a Healthy Lifestyle Programming Specialist to serve at South Side Community Coalition. The Ingham County Health Department AmeriCorps State Program is looking to hire one individual who is passionate about growing food and getting things done! Commonly known as the “domestic Peace Corps,” AmeriCorps is a national service program governed by a federal agency – the Corporation for National and Community Service (CNCS) – and administered in Michigan by the Michigan Community Service Commission (MCSC). AmeriCorps is a network of local, state, and national service programs that connects Americans in intensive service to meet our country’s critical needs in education, public safety, health and the environment. AmeriCorps members serve with nonprofits, public agencies, and faith-based and community organizations. Since 1994, AmeriCorps State members have provided needed assistance to millions of Americans across the nation. The ICHD AmeriCorps State Program places members at organizations to work directly with the community in areas of food security programming and youth programming to reduce obesity. We're looking for organizations within Ingham County who could benefit from the addition of one of our members. Our summer term starts April 22nd, 2019 and ends August 30th, 2019. The member will work with SSCC current after school and adult programming to bring nutritional and gardening education components to them! Our AmeriCorps member will do this by bringing kids into their hoop house and teaching them how to grow their own food, provide their food distributions with fresh locally grown produce, and help teach adults & youth how to eat healthier.​To view full position description CLICK HERE. Member will serve ~25 hours/week May 13, 2019 - August 30, 2019. - First hand experience in Lansing food systems! ​To view full position description CLICK HERE. All interested candidates must submit a cover letter and resume to Andrea Villanueva at avillanueva@ingham.org by April 11th, 2019 by 5pm! 1. Increase consumption of healthy foods and reduce food insecurity with gardening, food distribution and referrals. 2. Teach community members the importance of eating healthy foods and strategies to adopt better diets. AmeriCorps VISTA, or Volunteers in Service to America, is a national service program that was designed to eliminate poverty through capacity building in American communities. The VISTA program, created in 1965 and conceived by President John F. Kennedy, was formally incorporated into the AmeriCorps network of programs in 1993 and now governed by a federal agency – the Corporation for National and Community Service (CNCS). The Power of We Consortium AmeriCorps VISTA Program began in 2006 and has placed VISTA members at multiple host sites, or sub-sites, at area non-profits, public agencies, and faith and community–based organizations. The VISTA members commit to one year of full-time service in InghamCounty in the areas of education and economic opportunity. They have the unique charge of building their host site’s organizational , administrative and financial capacity. To view The Power of We Consortium current Americorps VISTA team, visit the AmeriCorps VISTA Sites page.